If you’re already publishing your books on Amazon, selling your books on Barnes & Noble is going to be an easy transition. To get started selling on Barnes & Noble you can follow this link https://www.nookpress.com/. Their self-publishing site is called Nook Press. When I’m listing a new book, I normally keep both sites open and cut and paste the required information from Amazon into Barnes & Noble. To list your book, click on Create new project. You’re asked to give your project a name. It can be the name of your book or another name you want to assign to it. The next screen that pops up asks you to upload your manuscript. You can use the same MS Word file you submitted to Amazon, just be sure to remove any references or links to Amazon in it. Once your manuscript has been uploaded, click on cover image to upload your book cover. After your cover has been uploaded you want to click on title & description. The first step is to update your title. Next, you are given the option to include a publisher name. If you have your own imprint name put it here. If you don’t have your own publisher name leave this item blank. 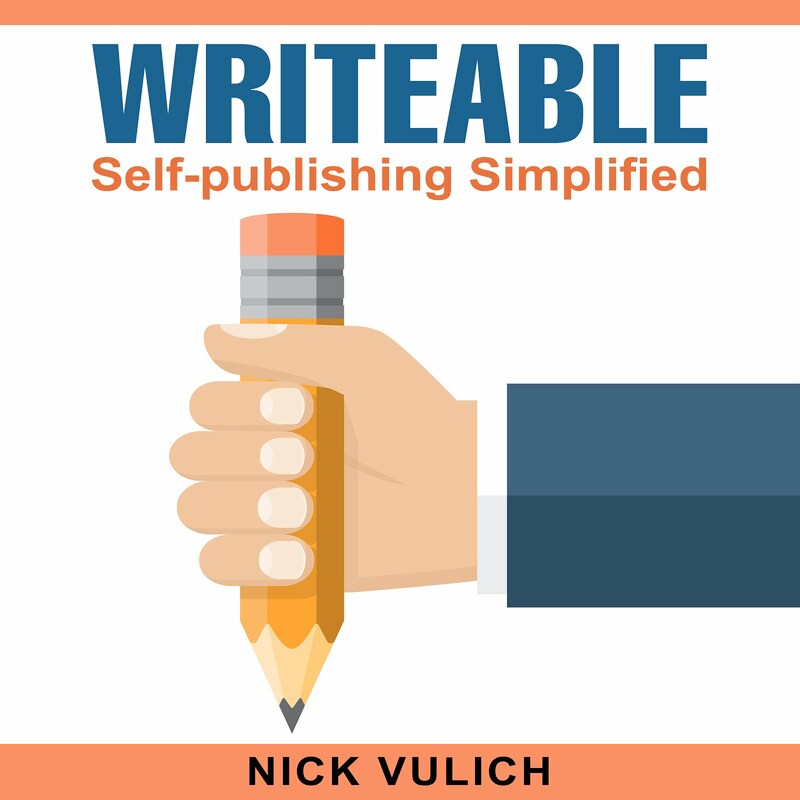 Use contributors to include anyone who participated in creating your book – authors, co-authors, editors, illustrators, etc. Below this is a section for your book description. I paste mine in directly from Amazon. The next section lets you enter your author bio. Once again, I paste it directly from Amazon. The last question asks if you have an eBook specific ISBN. In most cases, your answer will be no, and they will assign a free ISBN for your book. Be sure to click save and next at the top before you proceed, or you may lose all of your information. After this, you add categories. Barnes & Noble lets you select up to five categories, compared to only two with Kindle. Use all five categories if possible. Below this, you are asked to enter keywords readers can search on to find your book. You are allowed 100 characters and should separate each search term with a comma. At the bottom of this section, you are asked to choose the appropriate audience for your book and the language your book is written in. Once again click on save and next at the top of the page. The next page asks for information on rights and pricing. Depending on the rights you own select World sales rights or the United States only. 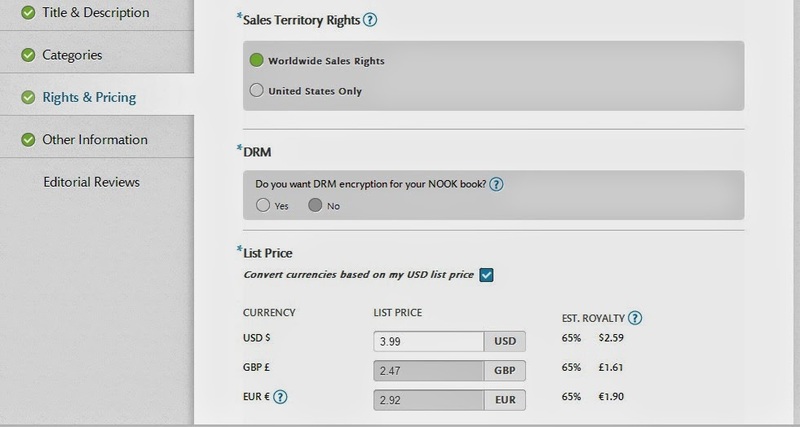 DRM lets you choose whether you want DRM encryption set up for your book. Finally, select your list price for the United States and the United Kingdom. When you are done entering this information click save and next. The next section concerns book details. Answer these questions, and click on save and next. The final section allows you to enter editorial reviews. If you have some enter them here. If not click on save, and the publish button will turn green at the top. Click on it, and your book is ready to be published. One more screen pops up and asks you which version of your manuscript to use. The one you edited in the previewer (if you changed anything), or the original version you uploaded. After this, your book should be available for sale within eight to twelve hours. Barnes and Noble pay out royalties sixty days after they are earned. My experience is they are not as consistent with their payouts as Amazon. 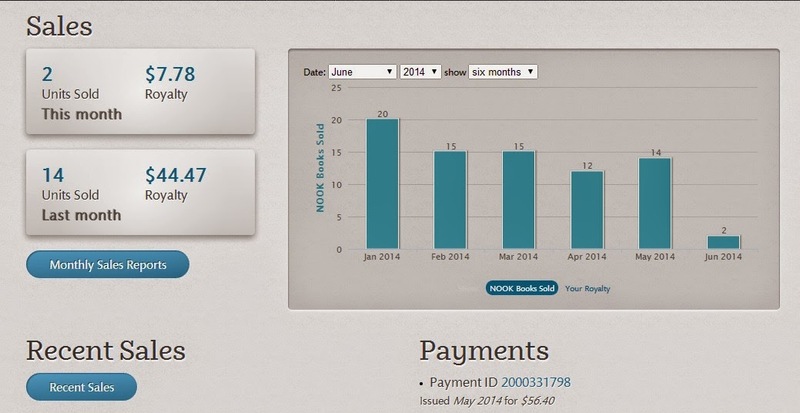 Some months the payment does not arrive until two or three days into the new month, so some months you won’t receive a payment. Royalties are 40 percent for books priced under $2.98 or over $10.00. Royalties are sixty-five percent for books priced between $2.99 and $9.99. My experience with Barnes and Noble has been mixed. I normally receive a forty to fifty dollar royalty payment, compared to a thousand or more from Kindle. Part of that may be that my four bestselling books are exclusive to Amazon, so it’s probably not a fair comparison. Over the next few months, I plan on opting out of KDP and making all of my books available across all of the sites listed in this guide so I will update my sales as things progress.